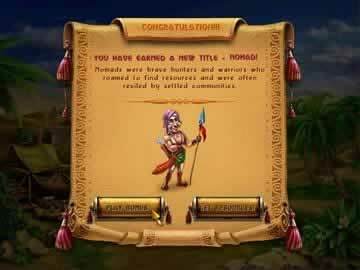 Cradle of Persia Game Review - Download and Play Free Version! Adventure in the Land of a Thousand and One Nights! If you are any fan of Middle Eastern history, then check out this interesting puzzle game. Work your way through this lengthy tale as you try to advance your civilization through several different historical epochs ranging from the age of the Achaemenid Empire to the periods of Turkish and Mongol rule. Construct buildings such as wharves, farms, bathhouses, and gardens, in between the levels by utilizing resources gained during hands-on play. Help to build one of the the oldest and most storied civilizations in mankind's history. At face value Cradle of Persia is like many other match-3 games. You drag your mouse over groups of three or more similar adjacent tile pieces and they disappear from the board with the ultimate goal being the removal of all squares bearing marble coloring before the timer runs out. Cradle of Persia adds in an element of depth at this stage in that the tiles used in a match represent a type of resource like food, gold, or supplies. You must collect enough of these resources during the puzzle play time in order to build up the buildings of your empire and advance to later epochs. With the added challenge of resource management, Cradle of Persia presents a refreshing twist to a tried-and-true game type. You'll find yourself strategizing and asking yourself if it's worth replenishing your supply of dynamite power-up at the expense of wasting extra time to complete a stage. In fact, you may have to think ahead before making each move, especially in the later stages, if you want to complete a level. Find a fun and challenging time with this game's staggeringly deep, mind-bending action. Add in a snappy soundtrack that remixes traditional Arabic tunes with fast-paced beats and you'll be pleasantly entertained for hours. 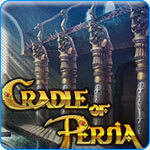 If you like puzzle games and Arabian themes, download Cradle of Persia today! Cradle of Persia is an entertaining game where you must build up the Persian Empire from the farms to the bridges by matching and collecting various supplies throughout the levels. The simple gameplay and controls make it a suitable game for everyone. There are over 100 different levels to play through as you collect supplies needed to create buildings. You can watch Ancient Persia grow from a few small buildings to giant structures. This is an addictive game that can keep you playing for hours at a time. In Cradle of Persia, buildings are created from three supplies: gold, food, and building materials like stone or lumber. These supplies are located throughout each level in tiles on a large grid. Some of these tiles are red in color. Your goal is to remove all the red tiles on the grid by matching supplies in groups of 3 or more. Matching in this game is a bit different than most match 3 games, as you'll need to chain together adjacent supplies to match them. You do this by clicking the supply you want to match, and then drag the mouse through supplies of the same type so that a long chain of supplies is created. It's an unusual matching mechanic that adds some challenge and strategy to the traditional match 3 gameplay. Additionally, you've got a limited time to complete levels, so you'll need to be quick. If you don't complete the level before time runs out, you'll lose a life. Lose them all, and you'll need to restart on the current section of Persia that you're building. While it's nice that the game doesn't just end, it also means that you may have to redo several levels over, which can be a pain. There are over 100 levels in the game split amongst several sections. Each section contains four buildings that you can build. Using supplies you earn while doing levels, you must construct these buildings, which can then give you bonuses like powerups or more powerful supplies. Powerups can destroy blocks or grant bonuses, and can even be upgraded as you play. The levels have a variety of layouts and obstacles to take on, like locked supplies that require you to match them before they can be moved. You'll also see the background art changing as the Persian Empire grows and you work on the different sections. One drawback to the game is the lack of difficulty settings and modes. The difficulty starts off fairly low, but quickly begins to ramp up. While this provides a good challenge, it can be overwhelming or frustrating for less skilled players, especially when you add in the limited time you have to work. Difficulty settings or other modes that would allow play without a timer, or on an easier setting would have been a great addition to open this game up to more players and add some variety to the gameplay. Like other similar match 3 games, the controls for the game are simple and easy to learn. The only thing you need to do in the game is chain supplies and make use of your various powerups, which can be done via clicking the mouse. The game gives you a quick explanation on how to form chains before you start playing. You'll also get helpful tips when you encounter new obstacles or mechanics to deal with (like locked tile/supplies). When it comes to the graphics and sounds in Cradle of Persia, they don't really stand out all that much from many other similar match 3 games. However, they don't take away from any part of the game either, and you won't find yourself needing to disable sound effects or music as you play. 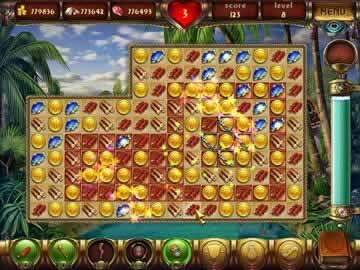 If you're looking for fast-paced and exciting match 3 action, Cradle of Persia might be just the game for you. It has a few issues like only one mode of play and a lack of difficulty settings, but has many more positive points as well. The simple gameplay and controls make it an easy game for players of any skill level to learn and get into. You can watch the Persian Empire being built from a simple farm to gigantic structures as you play through over 100 different levels. This game is a great choice for any fan of match 3 games and well worth trying. Watch a collection of gameplay clips showing the aspects of this match finding game and some of the power-ups at your disposal.